Once it fell to politicians and diplomats to solve international conflicts. Now, according to Israeli Prime Minister Binyamin Netanyahu, responsibility lies with social media. Tzipi Hotovely, Israel’s deputy foreign minister, headed off to Silicon Valley to meet senior executives at Google and its subsidiary, YouTube, late last month. Her task was to persuade them that, for the sake of peace, they must censor the growing number of Palestinian videos posted on YouTube. Israel has accused Palestinians of incitement for suggesting that A-Aqsa, the much-revered mosque in Jerusalem, is under threat, yet Hotovely recently said her “dream” was to see the Israeli flag flying at Al-Aqsa. One, Newsdesk Israel, took a four-year-old video of Palestinians revelling at their acceptance into the United Nations and repackaged it as footage of Palestinians celebrating Islamic State’s massacres in Paris. Another fabricated report suggested Palestinian citizens were proselytising for Islamic State by blasting its songs on their car stereos. Israeli politicians have misrepresented as a full-blown boycott the European Union’s recent tepid move to label products from illegal West Bank settlements and thereby deny them special customs exemptions reserved for Israeli products. The right argues Israel is being uniquely punished by Europe, when in truth the EU has enforced economic sanctions, not just labelling, against 36 countries. Israel’s Ministry of Foreign Affairs posted a satirical cartoon video today ridiculing foreign journalists and their coverage of the Gaza Strip for failing to report that “terror rules Gaza,”—not Israel. The video opens with a blond broadcast correspondent filming a segment on Gaza, where “the people here are just trying to live quiet lives. There are no terrorists here, just ordinary people.” In the background, a masked Hamas militant is firing a rocket. Next, the journalist is back above ground praising Gaza’s “liberal and pluralistic” society while another masked Hamas member bags and abducts a cartoon Gay Palestinian (he has a rainbow flag) in a sleeveless shirt who is selling fruit. But the foreign journalists misses everything. “Wait, just a minute,” interrupts a female character, passing the reporter a pair of glasses. Voila! With the special eye-wear the journalist can “see the reality of life under Hamas rule.” Overcome, the reporter has a heart attack and keels over. The video, produced in English, comes amid renewed focus on the 2014 summer war between Israel and Hamas. The United Nations is set to release a report outlining war crimes in the next few days, which the Palestinian Authority has said it will include in their dossier of charges against Israel at the International Criminal Court. Israel published its own lengthy legal inquiry absolving itself of misconduct under international law during the war on Sunday. A link to that report is on the government website to the right of the cartoon. Among the scenes videoed was a visit to the kitchen, which viewers can see is in need of repair. On Monday evening, however, Channel 10 news reported that the Netanyahus failed to include in the tour a glimpse of another modern, well-equipped kitchen located in their personal living quarters. If you click on the video I presented yesterday you will get the following message: This video has been removed by the user. Late yesterday there was a slightly different message: This video contains content from Noga Communications Channel8/Kids, who has blocked it on copyright grounds. Video tour of Netanyahu’s home: Innocent PR or inappropriate deal? Since the video clip was released on Sunday featuring a visit to the Prime Minister’s Residence in Jerusalem by interior designer Moshik Galamin, the question has been raised as to whether he got paid for the video. The clip shows Galamin being greeted by Prime Minister Benjamin Netanyahu and touring the official residence with Netanyahu’s wife, Sara. Along the way the film highlights disrepair and deficiencies in the home, at a time when the media have asked questions about allegedly extravagant spending by the Netanyahus at the public’s expense, and more recently allegations that the First Lady may have pocketed thousands of shekels in refunds from bottle deposits that should have been returned to the state. The Galamin footage shows a different, less extravagant and even shabby side to life at the residence, which may be to the prime minister’s advantage in the run-up to the March 17 Knesset election. But all those involved in producing the video, including Netanyahu’s Likud party and the family itself deny that the designer was paid for his involvement in it. Now, however, it appears that there may be another motive for the video. It was first posted on Galamin’s Facebook page and then shared on the prime minister’s Facebook page, and has since been viewed hundreds of thousands of times. Just after the fifth minute of the clip, while Galamin and Sara Netanyahu were touring her room, the camera focuses on a portrait of the prime minister and his wife printed on a block of wood. The picture was produced by a business that is owned by Galamin, which, about a month ago, began offering a product called Instablock in which pictures from the Instagram photo-sharing social media app are printed on wood or other blocks. The video in question shows a close-up of the back of the picture, featuring Galamin’s logo. When Galamin launched his new venture, he sent Instagram blocks to a number of celebrities, including the First Lady, in an effort to promote the project. Now he is indeed getting exposure for it, thanks to her. Galamin and the Netanyahu family did not respond directly to the question of whether it was decided in advance that the video would publicize the Instagram block. For his part, however, Eldad Yaniv, a Knesset candidate on the Zionist Union slate, petitioned the Central Elections Committee to order that the clip be removed from the Internet on the grounds that it constitutes an instance of corporate funding of election-campaign materials, which is against the law. Now, back to the IDF …. Certain segments of the ultra orthodox community view those that serve in the Israeli army as pigs, an insult needless to say to any Jew who follows the laws of Kashrut ( laws concerning Kosher food). Why then was it a surprise that Hamas tweeted the above poster? 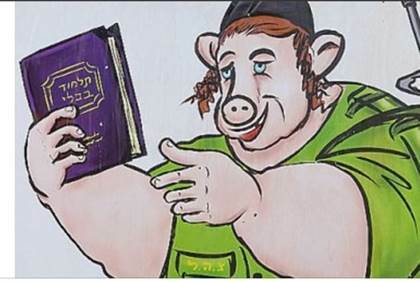 While many Israelis were outraged by a recent anti-IDF poster campaign by hareidi extremists in which religious soldiers were portrayed as pigs, the campaign has received an enthusiastic endorsement from another group of anti-Zionists: Hamas. Below you can see what the people of Gaza saw during the recent Israeli blitzkrieg. How could they not view these people as pigs? So why the fuss? If the sandal fits, wear it! Hey, T-Cref, look how apartheid’s grown! We live and die, stick it out till the end. Is AIPAC trying to stop you from seeing this video? The anti-war campaign group CODEPINK says the powerful Israel lobby organizationAIPAC is threatening to sue it over this video clip, a satirical version of an AIPAC policy conference promotional video. “On 25 February, an AIPAC [American Israel Public Affairs Committee] member called a CODEPINK staffer threatening legal action in response to a controversial video clip that he alleges was made by the peace group CODEPINK,” a CODEPINK press release states. The video features real footage from AIPAC conferences interspersed with images of Israeli abuses of Palestinian rights, and voiceovers from supposed conference-goers. CODEPINK spearheads annual protests at AIPAC’s policy conference. The Electronic Intifada sent an inquiry to AIPAC’s media office and this post will be updated if a response is received. It took 13 years for Israel to garner enough CHUTZPAH to present ‘proof’ that a child murdered by the IDF in Gaza wasn’t dead after all…. “On the other hand, many signs indicate that the two were never hit by the bullets,” the panel added in its conclusion. National Israeli panel of inquiry says iconic footage from start of second intifada reveals that Palestinian child apparently caught by IDF bullets did not actually die in the incident. Thirteen years after an exchange of fire in Gaza appeared to have resulted in the death of a Palestinian boy at the start of the second intifada, an Israeli investigative panel has found “there are many indications” that Mohammed al-Dura and his father, Jamal, “were never hit by gunfire” – neither Israeli nor Palestinian – after all. The national panel of inquiry further claims that contrary to the famed report carried by the France 2 television network on the day of the incident, September 30, 2000, 12-year-old Mohammed al-Dura appears to be alive at the end of the complete footage captured of the event. The investigative panel was commissioned by Prime Minister Benjamin Netanyahu and then-Strategic Affairs Minister Moshe Ya’alon in September 2012, and was headed by Yossi Kuperwasser, former director general of Israel’s Ministry of Strategic Affairs. It included representatives of the Foreign Ministry, the Defense Ministry, the IDF Spokesperson’s Unit and the Israel Police, as well as outside experts. The probe focused primarily on the France 2 report about al-Dura’s death and the events that followed. The report, which was presented by journalist Charles Enderlin, alleged that the boy was killed by bullets fired by Israel Defense Forces troops. The committee found that the evidence in the television station’s possession did not support the claim that al-Dura died as a result of IDF gunfire. It added that the report falsely created the impression that the channel had solid proof that Israeli soldiers were responsible for the boy’s death. The inquiry casts doubt on the possibility that the bullet holes left on a wall under which the boy and his father sought shelter were caused by gunfire that came from a nearby IDF post, as was suggested in the France 2 report. The committee stressed that “many question marks surround almost every aspect of the report,” further hinting that a boy named Mohammed al-Dura may have never existed. “Since it aired, the France 2 report about Israel’s actions has served as inspiration and justification for terror, anti-Semitism and the Israel’s de-legitimization,” the panel said. The photos of the Duras, father and son, taking cover behind a barrel during an exchange of gunfire between Israeli forces and Palestinian militants, near the Netzarim junction in the Gaza Strip, remains one of the most enduring images of the second intifada. Israel initially apologized for the boy’s death but issued a retraction when subsequent investigations indicated the boy was most likely killed by Palestinian fire. In a February 2005 hearing in Paris, French Web site owner Phillipe Karsenty claimed France 2 had staged the incident, claiming the footage showed the boy still moving his arm, even though the cameraman had said he was dead. 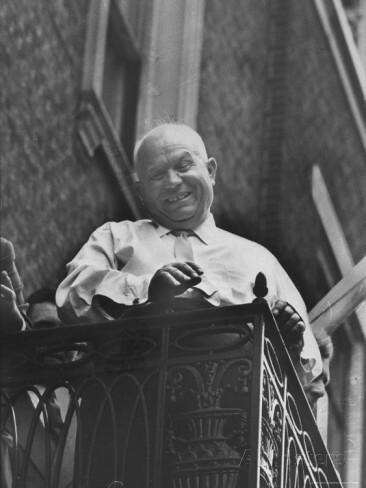 He provided a report from a French ballistics expert indicating the shots fired past the al-Duras came from the Palestinian position, and he pointed out that several scenes before the al-Dura incident appeared staged. The judge agreed in that hearing that some scenes did not seem genuine. However, Enderlin said that the images were no different from the clashes he had witnessed repeatedly. The prosecution stated that a dead Palestinian boy had been buried after the Netzarim junction incident, and that Jamal al-Dura consented to DNA tests that could prove the boy was his son. Easy to understand, historically accurate http://jewishvoiceforpeace.org/ mini- primer about why Israelis and Palestinians are fighting, why the US-backed peace process has been an impediment to peace, and what you can do to make a difference. 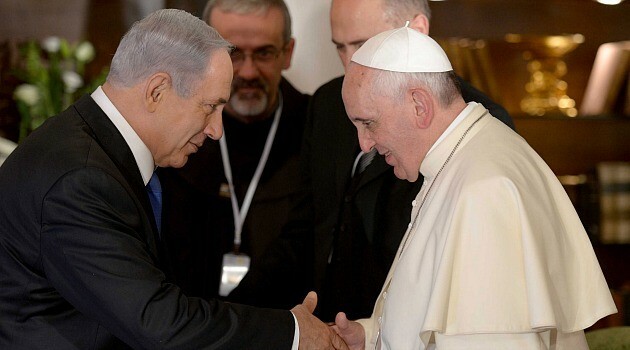 This conflict is essentially about land and human rights, not religion and culture. Endorsed by Palestinian, Israeli and American scholars and peace activists. The Onion, one of America’s most prestigious news outlets, has outdone themselves with the publication of the video presented below. Although they specialise in presenting a satirical view of daily events, this video hits it right on …. you must see it before AIPAC and Foxman pressure YouTube into deeming it unfit for public viewing. It’s a MUST watch! You must see it to the very end.